Weekends are all about indulging in a good hearty breakfast or brunch. It is one of those meals that can be enjoyed any time of the day. With that in mind, we’ve created a breakfast/brunch series for you to take inspiration from. Enjoy and don’t forget to use #halalchroniclesrecipes to share your re-creations with us. To prepare the rosemary crispy chicken, divide the chicken breast into 2 pieces. Marinade the chicken with salt, pepper and rosemary. Coat the chicken in flour, followed by an egg wash and then panko breadcrumbs. Fry in deep oil for approx. 20mins or until the chicken is cooked through. Meanwhile, prepare the other components to this brunch dish. To make the baked beans, take your onions and cook in 1tbp of olive oil for approx. 3mins. Add your baked beans and cooked for approx. 5 mins. Take your ready-made waffles and toast. Once the waffles have been toasted, plate alongside the cooked chicken. Slice the halloumi into approx. 1cm thickness and grill until the halloumi is nicely charred. Fry the egg sunny up and serve alongside the chicken and waffles, baked beans and grilled halloumi with chorizo slices. Prepare the Yorkshire pudding mix as per the packet instructions. Pour the mixture evenly into both cake tins. Place the mixture into the pre-heated oven and cook for approx. 20mins or until golden in colour. Meanwhile, prepare the scrambled egg. To prepare the baked beans, fry the onion in 1tbp of olive oil for 3mins. Add the baked beans and cook in the onions for 5 mins. Half the tomato and red onion and lightly grill. 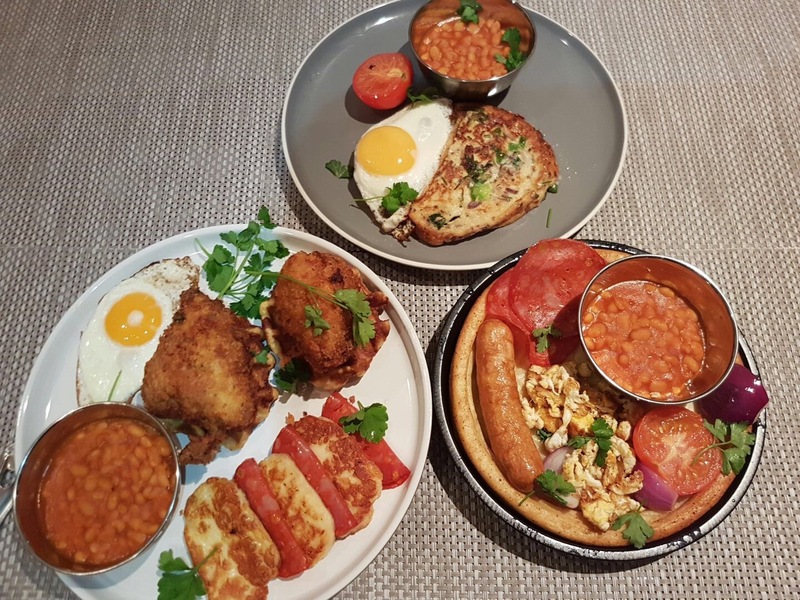 Remove the Yorkshire pudding from the oven and top with the sausage, baked beans, scrambled eggs, chorizo slices and grilled tomato and onion. To prepared the masala French toast, beat 1 egg with milk. Add the coriander, finely chopped chilli, red pepper and salt to taste. Coat the bread slices in the egg mixture and fry in 1-2tbp of olive oil until the French toast is cooked on both sides. Half the tomato and lightly grill. Cook the remaining 2 eggs sunny side up and serve on top of the masala French toast. Add the baked beans and grilled tomato. Garnish with a sprinkling of fresh coriander. Take 2 eggs and part boil in boiling water for approx. 5 mins. Meanwhile, remove the meat from 3 sausages and season with salt, pepper, paprika and coriander. Take the part boiled egg and coat in flour. Wrap the sausage meat around both eggs. Coat in flour, egg wash and then panko breadcrumbs. Repeat to create a double layer of panko breadcrumbs. Fry in deep oil for approx. 5mins. Add the chilli, spinach, coriander, red onion and coriander. Fry in 1-2tbp of olive oil until both sides are cooked through. Serve with Masala French Toast, Baked Beans, Sausage wrapped in turkey bacon, grilled tomatoes and fries (recipe for each can be found above). Fry the onion and garlic in 1-2tb of olive oil until both the onions and garlic have softened. Add the tin tomatoes and simmer until the sauce thickens. Taste the sauce and if required add brown sugar to reduce the sharpness. Add 2-3 eggs (separate evenly) and cook for 2-3mins until the egg whites have cooked and the yolk is runny on the inside. Serve with toast, sausages, wilted spinach and beans.